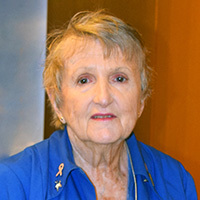 Treated for breast cancer at Winship more than four decades ago, Pat Graves wanted to give back and became a volunteer. Pat Graves was treated for breast cancer at Winship Cancer Institute more than four decades ago. She wanted to stay involved in the program that gave back to her in such an impactful way, so she signed up to be a volunteer in the Patient and Family Resource Center. "Volunteering at Winship is such a rewarding experience. Not only do I get to meet such inspiring patients and families, but I also get to work with a great group of volunteers who all have one satisfying goal, to put a smile on the faces of patients and family members," says Graves. Since 2003, the 77-year-old Graves has dedicated over 1,300 volunteer service hours, doing everything from pushing the hospitality cart to encouraging patients and caregivers. "The good humor of people who are in a tough place and the way they continue to positively manage treatment is truly inspirational, and that's what has kept me volunteering over the years," says Graves.